1. Does anyone have an extremely easy recipe for GF pulled beef in a slow cooker? 2. Do chain grocery stores carry a GF onion soup mix or cream of mushroom? check any "natural/organic foods" section. I know there are GF Cream of mushrooms. Not sure about the packets, but when I make something like pulled beef I just cook a pot roast in the crock pot with plenty of onions, salt, and pepper. Then shred. For BBQ sauce, pretty much any recipe should be fine. I don't think BBQ sauces are generally gluteny. If it calls for something like malt vinegar (not GF) you can sub something similar like apple cider vinegar. If it wants flour as a thickener, use cornstarch instead. Soy sauce? 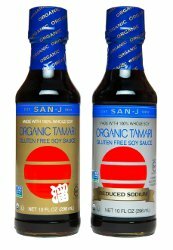 Use Tamari Soy (that's GF!) --not a brand, it's a type. pulled pork place pork roast in crock pot and add some water. cook on low. If you really need to season slice a real onion in the crock pot... The after it is shredded pour bbq sauce on it. if the sauce is gluten free. or may your own sauce. Of serve sauce on the side and just serve the pulled pork plain. I have a child who eats gf and as long as I make everything, there is no chance that it will have gluten in it. But if you have a Meijer, they have a gluten free aisle and I just noticed some gf soups that they just got in. Kroger has a lot of gf foods as well as health food stores. Our grocery stores have a growing gf section in the natural foods section. I am able to find gf bbq sauce, as well as powder to make broth. All soup mixes (dry or canned) unless marked as gf will have gluten in them. I think jam can have gluten as well so check the ingredients carefully. If you make your own bbq sauce, make sure the ketchup is gf. Watch out for maltodextrin or modified food starch. They're usually corn based, but can be from a glutenous source. The jam I found had no gluten. I'm severely affected by it, so I check every thing I buy. It really amazes me how much foods have gluten in them! I never thought of it until I started a dcb who can't have it and now I have to look at everything that I buy, mom even calls food co.for some products. Soy sauce really surprised me, I had no idea that some have gluten in it! Wheat flower has become the new "filler". Companies are keeping prices down by putting cheaper stuff in. You can buy the pure soy sauce but it is more expensive but tastes MUCH better and is better for you. Last edited by Michael; 03-01-2014 at 01:49 PM.